Prominent & Leading Manufacturer from Ambala, we offer stereo acuity test. 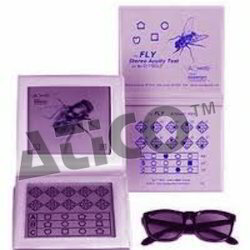 We offer impeccable stereoacuity test kit for the purpose of various medical diagnoses. Our Stereoacuity Testing Kit is appropriately designed for the rapid test of amblyopia and strabismus using gross through some fine Stereopsis. We make our contour stereoacuity tests kit available with new improved booklet and answer key behind the cover. These kits are remarkable for the both adult as well as pediatric polarized views. In addition to the above, we are one of the most reputed stereo acuity test kit suppliers and manufacturers of the market. Designed to rapidly test for amblyopia and strabismus using gross thru fine Stereopsis (4800 to 20 seconds of arc). Graded circle test from 400 seconds now down to 20 seconds with no monocular clues. New improved booklet has answer key on back cover and includes polarized viewers. Designed to rapidly test for amblyopia and strabismus using gross thru fine Stereopsis (2500 to 20 seconds of arc). Graded circle test from 400 seconds now down to 20 seconds with no monocular clues. New improved booklet has answer key on back cover and includes polarized viewers. Looking for Schiotz Tonometer ?